Past research has proven that palliative care — specialized medical care focused on pain and symptom management as well as psychosocial interventions to improve quality of life — benefits patients with malignant diseases such as aggressive cancers. Vanderbilt University Medical Center (VUMC) health care providers are now studying whether palliative care can also benefit those with advanced liver disease, a diagnosis that precedes either a life-saving liver transplant or death. Advanced liver disease, also known as decompensated cirrhosis, is a progressive illness that develops after chronic inflammation leads to cirrhosis or scarring of the liver, which leads to a significant disruption of the liver’s function. While the hepatitis C virus and alcoholism are leading causes, fatty liver disease from obesity is also a growing reason for the disease’s development, said Martin. The only existing cure for advanced liver disease is organ transplantation, but many patients who need a transplant don’t receive one due to a shortage of donor organs or they can’t undergo liver transplantation for other medical reasons. Patients with advanced liver disease can develop ascites or fluid in the abdomen, as well as fluid in their lungs and severe muscle pain and cramping. These individuals have to follow a specific diet and strict fluid restrictions, and all these factors can greatly affect their quality of life, she said. Study participants are adult patients admitted to Vanderbilt University Adult Hospital with advanced liver disease and a poor prognosis, as identified by their hepatologist. Participants either receive usual care for their disease management or usual care with the addition of palliative care services. Those services, involving both patients and their caregivers, include education, symptom and pain management, as well as addressing other issues such as stress and depression. 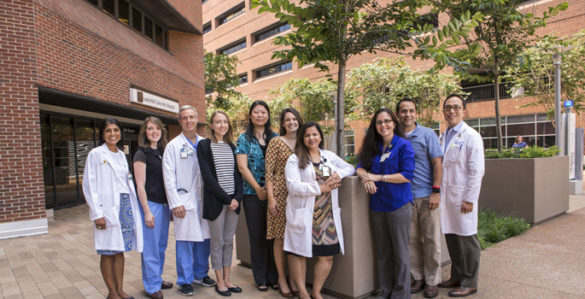 Vanderbilt has a hospital-based Palliative Care team led by specialty-trained physicians, nurse practitioners, case managers and social workers. Palliative Care staff also work closely with other specialists, including pastoral care, child life and pharmacy. Study participants who receive palliative care services receive follow-up telephone consultations with palliative care team members for at least one year after their hospital discharge. All participants complete surveys at specific points throughout the year. “We’re hoping to find that patients who receive palliative care will go for longer periods of time before a hospital readmission, but more importantly, we’re gathering data on quality of life, symptom management and caregiver fatigue, and we’re hoping to show significant improvement in these areas as well,” Martin said. Investigators aim for the study to be replicated for other patient groups in the future, such as those with end-stage lung disease, and end-stage cardiac disease. The hopes are to develop a protocol for engaging palliative care services in patient care that can be applied to many disease processes and even at other institutions. Chan Chung, M.D., assistant professor of Medicine in the Division of Gastroenterology, Hepatology and Nutrition, has regularly referred patients with severe liver disease to Palliative Care when he feels those services will improve their quality of life, and he is part of the research team for this study. “Subspecialists like me tend to focus on the medical condition,” Chung said. “We have limited time during clinic visits or even in the hospital, and we don’t always have time to ask our patients, ‘How are you feeling about all of this?’ or ‘Does your family understand what’s going on?’ I do have those discussions with my patients, but at the same time I appreciate someone who can spend additional time and has professional expertise in terms of symptom management and quality of life issues stepping in. “People often have the misconception that palliative care is a death sentence, and it’s just not. It’s about giving patients and families more options. It’s comprehensive care. I have seen how our palliative care colleagues can really help patients and families achieve liver transplantation and also to help improve their quality of life even if they are unable to undergo liver transplantation,” Chung said. The study, named the Creation of Models for Palliative Assessments to Support Severe Illness (COMPASS) Investigation: Testing Early and Ongoing Implementation of Palliative Care for Incurable Non-malignant Diseases (NCT03022630), began in February 2017 and is expected to end in 2020, with a target of 400 participants.